Designing with environmental sensibility is evolving as a vital subject in architecture on both professional and academic level. We are at a critical moment wherein environmental considerations are becoming increasingly important in the design process. Set in a studio environment, the workshop will introduce an integrated approach to design multi story buildings with environmental sensibility. It will provide participants with tools and techniques to integrate environmental data and site-specific issues early in the design process, and be able to respond to them in their design. It will also focus on teaching students how to deploy these principles as a design strategy for different types of projects. The recent development of sophisticated computational design tools has instigated new ways of integrating computation in the design process; both within architecture and engineering disciplines. The new set of digital tools has infiltrated a bottom up system to open the design space towards a high level of complexity. The integration of these tools allowed the architect to generate and control complex information derived from a manifold of sources. Fabricated Topologies-Beginners is a 3-day workshop that has been designed for participants with no previous experience in Grasshopper or parametric design techniques. The program will introduce them to both the theoretical and technical knowledge required to explore possibilities of the new design medium. The workshop will also prepare participants for the entry level of the intermediate / advanced workshop Fabricated Topologies, which is taking place on Jan 17-21, 2017. Behavioral Topologies investigated the relationship between topology and form-finding strategies. Participants have developed their own selected projects, using techniques presented in the workshop. Workshop exercises explored the use of Polygonal Modeling in combination with Particle Systems, Structural Analysis, Topology Optimization, Evolutionary Solvers and Vectorial Fields to design forms of different scale and complexity. The proposed workflow combined the use of Maya, Rhino, and Grasshopper with some plug-ins such as Kangaroo, Millipede, Weaverbird, and others. During the workshop, participants have been introduced to polygonal modeling in Maya, visual programming in grasshopper, and learned how to prepare their final model for 3D Printing. The three-day workshop explored new possibilities of the robots and digital materialization to redefine artifacts design far beyond the pre-determined creation of forms. Through the code-matter-machine interaction process, inFORMed Clay participants studied the potential emergent behaviors of the system as well as learnt and exerted a new sensibility to the computational design/fabrication process by tapping into the self-organization properties of matter as a key factor in determining characteristics of the output shape. The aim was to go beyond the current state of prototyping wherein the physical prototype is a clone of its digital counterpart, thus making fabrication a purely a replication phase. Instead, by coding and embedding additional levels of informations related to defining robotic behavior and material properties, the production and digital fabrication phase becomes an integral part of the design process. The five-day workshop explored the potential of machine learning neural networks in the development of an urban fabric of a particular sector in Dubai. We demonstrated how the parametric model can be presented to the network and how does it influence its effectiveness and decisions making process in directing the design workflow. The workshop tested multiple data input and explored the network response based on the self-learning generative nature of the network. Based on the network interpretation to the input data, participants were able to visualise the network growth outcome, and understand its data interpretation and decision making process. Behaviour of the system was therefore developed by assessing its propagation on a basic organisation level, then developing it to work on a variety of urban levels. Fabricated Topologies” explored form-finding techniques using complex mesh topologies to generate and fabricate different scale prototypes. The five-day workshop introduced participants to parametric design to fabrication workflow using force-based form finding techniques to generate, simulate, fabricate, and assemble different scale prototypes using a combination of Rhino/Grasshopper with selected plug-ins such as Kangaroo, Ivy, Weaverbird, and few others. Different topologies have been developed as a result of a negotiation between the applied forces, the selected material, and the design intent as set by the different participants. As part of Dubai Design Week, Growth is an introductory 3d printing event that aims to introduce people to the possibilities offered by the 3d-printing technology. The process integrates personal data taken from each participant, such as their date of birth or an anniversary, and translate it into a 3d printing piece in the form of a jewellery. The printed pieces are inspired by algorithmic structure taken from growth systems as found in nature to produce unique design artefacts. They exhibit a variety of natural forms and patterns while each relates to the personal data as fed by the participant. 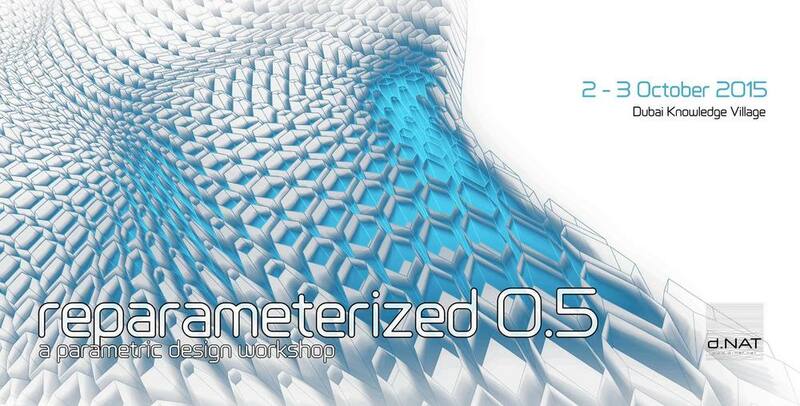 Materialize workshop aims to explore the relationship between form generation, materials, and applied forces. This process, that is referred to as topological optimisation, seeks to optimise material distribution within a certain boundary condition. It thus entails a shift from traditional form finding techniques to processes of a generative and performative nature by assuming a seamless integration of geometry, material, and performance. We will be exploring matter and agents behavior through Grasshopper (with Millipede, Anemone and Cocoon plugins), interrogating the aesthetic potential of Topological Optimization and Multi-Agent Systems to generate material-driven adaptive structures. This workshop will introduce the starting knowledge for further research on the subject of materiality as a design input that informs form generation. Parametric shadows is a design to fabrication workshop which employs parametric design techniques to design and fabricate a lamp-shed. The 4-day workshop- which runs over two weekends - has been designed for participants with no previous experience in Grasshopper or parametric design techniques. 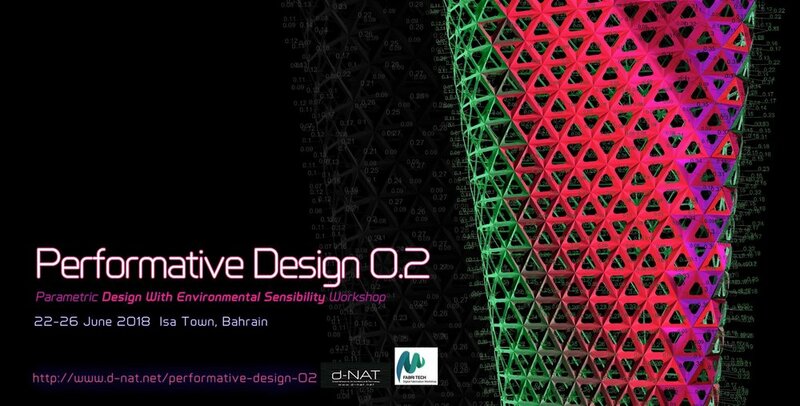 The workshop program will introduce them to both the theoretical and technical knowledge required to explore possibilities of the new design medium, then to apply the learning techniques to design and fabricate a parametric skin that will be adopted as a lamp shed, produced with a laser cutter or a 3d printer. The workshop aims is to teach students principles of parametric design and the process of taking their design out of the computer and into realisation. The recent development of sophisticated computational design tools has instigated new ways of integrating computation in the design process; both within architecture and engineering disciplines. The new set of digital tools has infiltrated a bottom up system to open the design space towards a high level of complexity. The integration of these tools allowed the architect to generate and control complex information derived from a manifold of sources. Reparameterized is a 2-day workshop that has been designed for participants with no previous experience in Grasshopper or parametric design techniques. The program will introduce them to both the theoretical and technical knowledge required to explore possibilities of the new design medium. Throughout the engagement of parametric digital tools, Performative Skins workshop will introduce participants to the logic and principles of parametric design, and will apply the learned techniques in a design exercise to explore this paradigm shift. By introducing different methods of creating variations within the subdivided surface in response to certain forces, system differentiation will be created as a result of a feedback loop and negotiations between the applied environmental forces and the participant’s aesthetic sensibility. This data-driven process will transform the role of patterns from being decorative additive elements into performative integral ones with technical responsibilities for daylight modulation, temperature control, and space enclosure. The aim of the workshop is to explore new design possibilities based on the mapping of selected contextual forces, and to expand the design space towards data-driven, performance-oriented design. The recent development of sophisticated computational design tools has instigated new ways of integrating computation in the design process; both within architecture and engineering disciplines. The new set of digital tools has infiltrated a bottom up system to open the design space towards a high level of complexity. The integration of these tools allowed the architect to generate and control complex information derived from a manifold of sources. Reparameterized is a 2.5-day workshop that has been designed for participants with no previous experience in Grasshopper or parametric design techniques. The program will introduce them to both the theoretical and technical knowledge required to explore possibilities of the new design medium. The space where we live can be monitored in many ways and it appears, even more, to be in a state of flux - a gradient of data in continuous evolution and change. Our understanding of the surrounding environment is improving everyday due to our ability to scan and sample the environment around us at increasing resolution using better technologies and sensors. Hence the space is revealed, beyond its physical boundaries, as an ever-changing data field. Our capability to act and design the space itself can be enhanced by the use of specific tools which are able to inform the design process with more accurate, specific and adaptable manifold of data streams and patterns. InFORMed Verticality is an advanced Grasshopper workshop aims to explore ‘data embodiment strategies’ to inform the generation of vertical digital morphologies through the integration of specific set of conditions and rules. We will be exploring data processing methodologies of self-organizing processes to generate digital systems using advanced mesh modeling techniques and assess their application in the development of differentiated complex systems of vertical structures; starting with a simple formation and moving into more complex ones. The aim is to teach participants algorithmic design methodologies through the integration of selected information and data articulation to generate spatial and architectural vertical formations. EXPOn-tial is an Advanced Grasshopper workshop aimed to explore the potential of growth processes and assess their application in the development of an urban fabric. Natural growth processes share common traits such as being non-linear, rule-based, and iterative. Drawing a parallel between natural systems behavior and computer growth processes such as branching systems, diffusion limited aggregation and other rule-based processes, we developed non-linear growth processes and evaluated the spatial results and forms across a wide range of scales - from Material to Urban scale. Behavior of growth processes depended largely on material properties as it influenced clustering and distribution across a terrain. The system was developed by assessing their potential character on a basic level of organization first, then developing it to work on adaptation processes of autonomous, coherent objects on a variety of scales. Throughout the engagement of parametric digital tools, the workshop will introduce design exercises to re-visit the traditional Mashrabiya and to liberate it from its repetitive pattern and form. By introducing different methods of creating variations within the subdivided surface in response to certain forces, the new parametric skin will become responsive to different levels of interactions. New levels of transparency will thus arise from a communicative act between the observer and the observed, between light and dark, between movement and stillness, between openness and enclosure. The dialectical relation between the skin, which implies enclosing, and transparency, which suggests the opposite, will be re-examined in the new data driven responsive skin. Over the last two decades, the digital revolution instigated new typologies of architectural skins and patterns. Patterns started to acquire a new role in the architectural form, moving beyond their historical symbolic decorative role into spatial devices; correlating with form structural and environmental properties. The workshop explored this paradigm shift of the function of patterns from being decorative additive elements, into performative integral elements with technical responsibilities for daylight modulation, temperature control, and space enclosure.